Pups now fly for a an amazing land and air adventure on subway. We are featuring the air and land patrollers with the teams best outfits ever. Paw pups subway patrol teaches your kids navigation skills while having fun at the same time. All the other pups are locked away by an unknown monster and you have to select a paw pup and fight your way to the place where all the other pups are locked to set them free! Collect as much coins on your way to unlock more paw pups while on patrol. You can make 6 pups fly in the sky in the subway world. Each and every game controller is made exclusively for kids. Also note that this game is not affiliated with paw patrol in any way possible. Collecting coins can also help you to increase your speed and buy more power ups which will help you in playing the game better in so many ways. 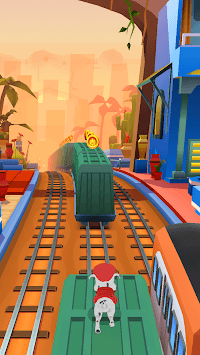 Avoid all the trains and you have to avoid other obstacles and unlock super powers on the way. You can save the day with the help of pups with the help of paw pups super powers on patrol. There are mission badges and coins collection for more powers upgrades.